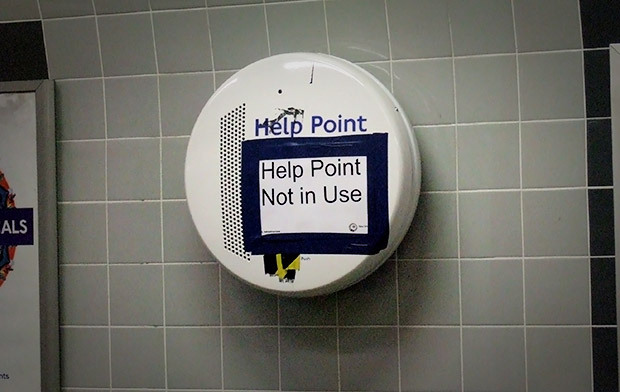 It’s not a very helpful Help Point, but at least it helpfully tells people that it is a Help Point that is not in use. It’s like when the they announce a long list of tube lines closed for the weekend, then say “but there’s a good service on all other lines”. No there isn’t, it’s a weekend skeleton service on the remaining open lines, packed full of people trying to get from A – B with half the underground closed! I do feel sorry for Londoners at the weekend, it must be a nightmare for the car-less majority when so much of the tube is closed. I suppose they have to do the work sometime.